Our clinic has many patients coming in to assist with optimizing their fertility, or helping them get ready for IUI, or IVF. In this article I wanted to give some resources that may be helpful for women who aren’t yet pregnant but are wanting to get pregnant within the next couple of years or months. Many women ask us about diet, and although we know much in this area, there are colleagues of ours that know even more. Katie Altneau is an acupuncturist in Denver, CO who has a fertility program for women focused on diet and self-care. Her site offers a 4-day fertility cleanse, and a fertility meal plan that includes recipes and shopping lists. She also has a postpartum meal guide. She’s terrific at what she does and we highly recommend her. Katie even has some guided meditations for fertility, which many of you have asked about. Kathryn Flynn, right here in Jacksonville, OR runs a company called Fertile Foods. Her site has a wealth of information on it as far as recipes and resources go. She also makes and sells fertility tea blends. Acubalance Wellness is a fertility acupuncture clinic in Vancouver, BC. If you are looking for tons of information on the topic of nutrition and diet, then this site has so much available info to sift through. Here is the link for their food and diet page. And as many of you already know, acupuncture is amazing for getting the body ready for conception and working with women as pregnancy occurs and progresses. It’s also a wonderful modality for postpartum conditions and issues that can commonly arise. Please share this article with anyone you know that wants to optimize their fertility or is planning on conceiving soon. Have fun cooking and eating the healthiest foods for you and baby to come. It has been a busy past few months for us at Holistic Health Acupuncture. This February Jenn Collins and Jenny Riegg began offering acupuncture treatments to patients at La Clinica Wellness Center in Medford, Oregon and are excited to keep building our partnership with such a great clinic, staff and clientele. Jenn & Jenny are there 2 days a week treating everything from headaches, back & neck pain, and allergies to insomnia, stress and support with smoking cessation. Patients have been very thankful for our services and we are happy to be part of the growing trend of acupuncture being integrated into primary care medical settings. 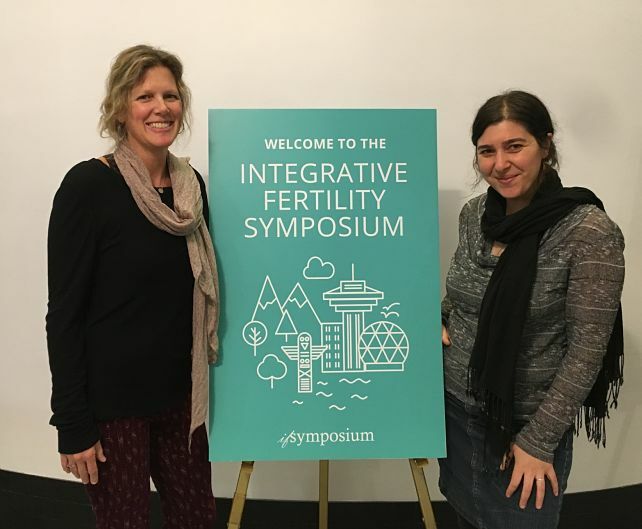 We also had the privilege to attend the annual Integrative Fertility Symposium (IFS) in Vancouver, B.C. earlier this Spring. IFS brings together leading professionals in the fields of fertility, maternity care and pediatrics. Acupuncturists, MDs, NDs, NPs, Reproductive Endocrinologists, and Nutritionists gathered for 4 days of courses specializing in reproductive health. It was incredibly inspiring to be surrounded by so many brilliant speakers and clinicians from all over the globe and we are enjoying bringing back what we have learned to our clients here in the Rogue Valley. Here are a few links to some of this information that we’d like to share with anyone interested in women’s health, pregnancy, and fertility. The Center for Menstrual Cycle and Ovulation Research has a lot of articles and resources for women of all ages on their page. Debra Betts, a leading expert on acupuncture and pregnancy from New Zealand, has an incredible site filled with information for anyone wanting to know more about how acupuncture can help with pregnancy. Dr. Lorne Brown of Acubalance Wellness Center in BC has a plethora of talks, interview, and articles on his site for understanding how acupuncture works and adds to the success of Fertility treatments. It is a joy and honor to work with women during pregnancy and both Jenn & Jenny have specialty acupuncture training in maternity care. Acupuncture is able to offer safe and effective support for myriad conditions through all stages of gestation encouraging wellness for both mom and baby. Some women sail through pregnancy with few issues while others need extra support and medical care. Acupuncture and some herbal remedies can be safely used throughout all trimesters offering a viable alternative to prescription medications and more invasive interventions. The most common conditions seen to respond well to acupuncture during pregnancy include morning sickness, fatigue, heartburn, constipation, hemorrhoids, back and pelvic pain, sciatica, headaches, stress and anxiety. Through acupuncture and herbs we also work with abnormal bleeding and threatened miscarriage as well providing complementary care for certain higher risk conditions such as preeclampsia, gestational diabetes and breech presentations. We encourage our maternity clients to begin coming in weekly starting at 36 weeks for our Pre-Birth treatment series. These are treatments using standardized point protocols shown to encourage cervical ripening helping to optimize efficient and safe births and fewer medical interventions. And don’t forget to include acupuncture and herbs for post partum care. A tremendous amount of Qi & Blood is expended during gestation, birth and lactation and we highly encourage new mothers to come in to rebuild their vitality and for self care after baby has arrived. We can assist in post-partum hormone balance and depression, lactation issues and more.